Above: The wire-mesh elephant at Waterloo Station. No – not the ‘Elephant and Castle’! Just the ‘Elephant’. Its a lovely piece of public art and, remarkably, the elephant is formed from wire mesh. It is to be found at Waterloo Station which is so vast you will need to know where to look. This unusual work of art stands at the top the main escalators from the underground that come to the surface opposite the Jubilee Line ticket hall at Waterloo underground. This ticket hall is just off Waterloo Road. It is the work of Kendra Haste, a specialist in animal sculpture – including lions, tigers and other exotic animals at various locations in London and in other parts of England. Her wire sculptures are quite remarkable. 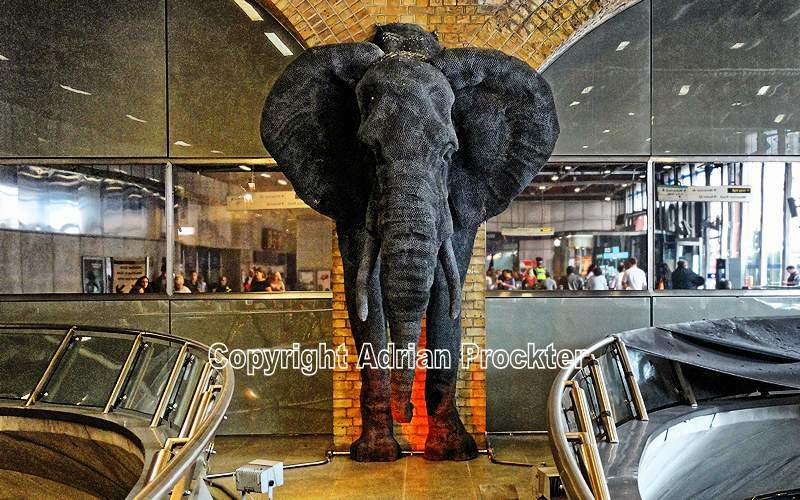 So why is there an elephant at Waterloo? The answer needs a little patience to explain. Kendra Haste produced a wire elephant a few years ago, for a temporary exhibition at Gloucester Road underground station and it was purchased by London Underground for Waterloo Station. The African elephant was put on display above the Waterloo escalators to the Jubilee Line extension when it opened in 1999. The station stands next to the site of Astley’s Amphitheatre, often credited with being the world’s first circus ring. This auditorium was to be found at the eastern end of Westminster Bridge (land now occupied by St Thomas’s Hospital) and lasted from 1773 to 1893. Many exotic animals were displayed, including elephants. The well-known traffic interchange – the Elephant and Castle – is only a short distance away and it so happens that the wire elephant faces in its direction but that is probably coincidental. This entry was posted in /Lam-Lambeth. Bookmark the permalink. That is fascinating – I didn’t now about it – and as a big elephant fan, the next time I’m in London, I will have to seek it out. I’ve enjoyed perusing your informative site – thank you. Thank you for your comment. Why not click on ‘Follow’ and enter your email. The blogs will be sent to your email address, its totally free and you can cancel at any time. Are any of your photos for sale to public? The short answer, Monica, is ‘Yes they are for sale to the public’. Nearly all the images on the blogs are my own and they are for sale to the public. Just a very few images were NOT taken by me and obviously, I do not have the authority to sell them.